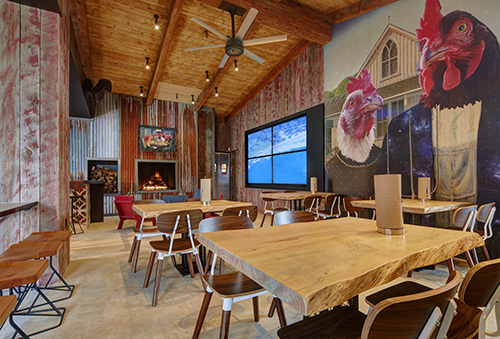 Successful fast-casual restaurant chain expands to a second location with a winning Audio-Video formula anchored by ELAN with SpeakerCraft and Sunfire audio. PETALUMA, CALIFORNIA — When you find something that works, you stick with it. That simple wisdom holds true for much of life, and in the case of The Crack Shack, an organic, locally-sourced chicken and eggs restaurant that first opened in San Diego in 2015, it means outfitting its new Encinitas location with the same powerful ELAN Entertainment & Control System that gives managers and staff full, simple control of audiovisual and surveillance systems at the San Diego location. According to systems integrator Zack Paradise of Paradise Infotech, the ELAN system gives staff an easy way to manage TVs, audio systems, cameras and climate control. Plus, the owner can use a single ELAN app to monitor multiple locations. 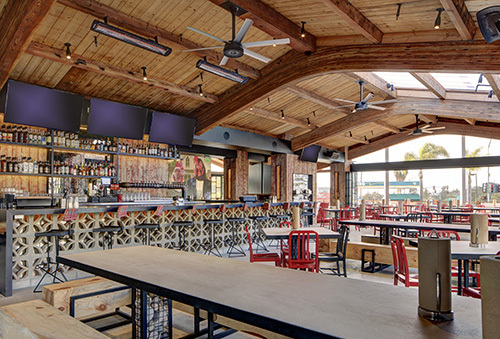 The audiovisual system at the new Encinitas Crack Shack offers bar patrons live TV, but also creates an ambience in the restaurant that differs from how many other eateries focus their technology. In the seating area adjacent to the bar, a 2x2 videowall featuring four 70” JAP displays can easily switch from a professional sporting event to a calming scene of ocean waves washing ashore, depending on the needs of the moment. Using three Risevision digital signage players, the restaurant’s messaging can be laid over live TV content from six DirecTV boxes, or displayed on its own. All of these systems are connected to an ELAN gSC10 controller, the brain of the control system. Audio is played through 16 in-ceiling SpeakerCraft speakers throughout the restaurant, while 10 Wirepath IP cameras keep an eye on every part of the business. All of this is viewable and controllable from the ELAN mobile app, which staff can access on a wall-mounted iPad, and managers and the owner can access on their iPhones from anywhere. 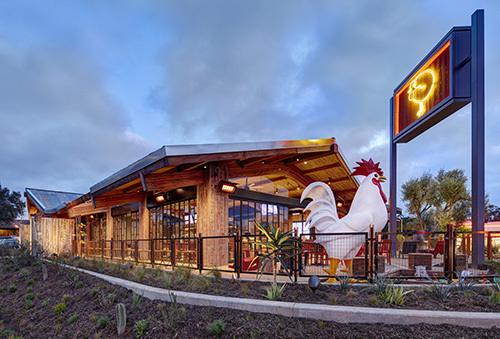 Similar to the San Diego location, the new Crack Shack makes use of an open-air design. Because of its location near the ocean and a comfortable year-round climate, the building’s floor-to-ceiling accordion windows create a unique, inviting dining experience. Climate control in the dining area is a mix of ceiling fans, electric heaters and the near constant ocean breeze. In the kitchen, the ELAN system ensures staff have a comfortable work environment. Part of the roof was replaced with a plastic roofing solution to provide more light and add to the ambience. As the chain continues to thrive and consider additional locations, the owner and the integration team at Paradise Infotech know they have a robust and replicable control and entertainment model with ELAN. ELAN, from Core Brands, develops an award-winning line of whole-house entertainment and control solutions distributed through a comprehensive channel of select dealers throughout the United States, Canada, and countries worldwide. The new ELAN 8 update was honored with the “2017 Human Interface Product of the Year” award from the Consumer Technology Association’s Mark of Excellence Award Program Committee at CES 2017. Anchored by the ELAN Smart Home Control Platform, Core Brands combines the strengths of its iconic control, audio, power management, connectivity and video distribution brands – ELAN®, SpeakerCraft®, Gefen®, Niles®, Panamax®, Proficient®, Furman®, Sunfire® and Xantech® – to deliver a portfolio of connected home and commercial solutions to its channel partners and end users. For further information, visit www.corebrands.com.